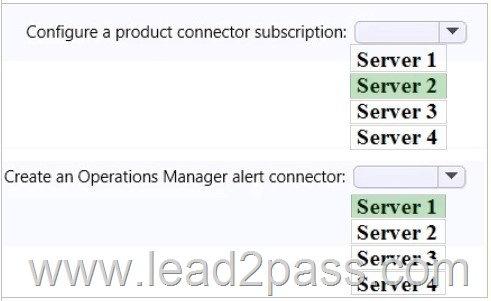 In System Center 2012 ?Service Manager, you create a service level objective to create relationships between a queue and a service level, a calendar item and a time metric, and actions that occur before or after service level breaches. In order to create a service level objective, it is easier if you have already created or defined a calendar item and an SLA metric. Additionally, the service level objective that you create is linked to a queue. You manage a System Center 2012 R2 Operations Manager deployment. The deployment contains a server named Server1 that runs Windows Server 2012 R2. You discover an alert for Server1 generated by a monitor named Monitor1. Monitor1 does not implement on-demand detection. When you troubleshoot the cause of the alert, you discover that the issue causing the alert was resolved. You need to ensure that once you close the alert, an alert will be generated if the same issue reoccurs. What should you do before closing the alert? To answer, select the appropriate options in the answer area. Recalculate Health – this forces the monitor to recaclulate health, telling it not to wait until the next scheduled execution. State changes depending on the outcome of the health check. Using Health Explorer, you can reset the health state of an entity or recalculate the health of entity. Reset Health – if possible this will reset the monitor to healthy and close the alert. If the problem still exists the monitor will stay healthy until the next check. Only reset health for a monitor when you are sure that all issues have been resolved. Your company has a public website that is hosted in Microsoft Internet Information Services (IIS). You need to use Operations Manager to monitor the availability of the public website from the United States, Europe, Asia, and Australia. *Box 1, box 2: Run the GSM (Global Service Monitor) installer package from a machine which has System Center Operations Manager 2012 SP1: it will install GSM management packs. In order to receive full information regarding Visual Studio Web Test results, you need to import the Alert Attachment MP (available in the installation image for OpsMgr 2012 SP1) and enable file attachments for alerts. * Box 3: Make sure Windows Identity Foundation is installed on your management server that is communicating with the cloud and everywhere the Operations Manager console is installed. Windows Identity Foundation is required. This feature allows you to program an application to serve HTTP requests by using core IIS functionality. * Simple TCP/IP Services supports the following TCP/IP services: Character Generator, Daytime, Discard, Echo and Quote of the Day. Simple TCP/IP Services is provided for backward compatibility and should not be installed unless it is required. 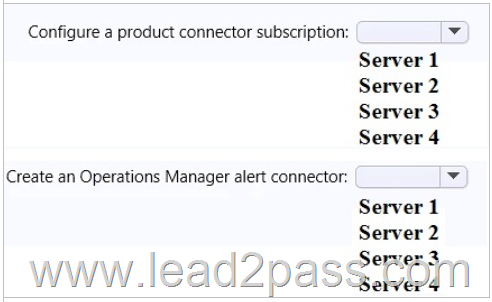 – Open an incident in Service Manager when Operations Manager raises an alert. – After the incident is open, remediate the error that caused the alert. You manage a System Center 2012 R2 deployment that contains the servers configured as shown in the following table. You have a Microsoft Azure subscription. All three servers have the Azure PowerShell module installed. You need to ensure that you can run Azure PowerShell cmdlets from Runbook Tester. A. From Server2, deploy the Integration Pack for Windows Azure to Server1. B. On Server1, add the Run.NET Script activity. Add the Import-Module Azure cmdlet to the first line of the script. C. On Server1, add the Run.NET Script activity. Invoke C:\Windows\System32\WindowsPowerShell\v1.0 \PowerShell.exe in the first line of the script. D. From Server2, deploy the integration pack for Representational State Transfer (REST) to Server1. The Integration Pack for Windows Azure is an add-on for Orchestrator in System Center 2012 Service Pack 1 (SP1) that enables you to automate Windows Azure operations related to certificates, deployments, cloud services, storage, and virtual machines using the ‘2012-03-01’ version of the Windows Azure Service Management REST API. The domain contains a user account named Account1. You plan to implement an update baseline in VMM. From the Virtual Machine Manager console, you plan to add Server2 as an update server. VMM will use Account2 to manage WSUS. You need to identify the group to which you must add Account1 on Server2. Which group should you identify? If users do not have appropriate permissions for the WSUS console, they receive an "access denied" message when trying to access the WSUS console. You must be a member of the Administrators group or the WSUS Administrators group on the server on which WSUS is installed in order to use the WSUS console. You have a System Center 2012 R2 Configuration Manager deployment and a System Center 2012 R2 Virtual Machine Manager (VMM) deployment. All servers are Configuration Manager clients. You have a Windows Server Update Service (WSUS) server. Configuration Manager is configured to use WSUS for software updates. – Hyper-V hosts must be excluded from receiving software updates from Configuration Manager. – VMM must apply software updates to all of the Hyper-V hosts. – VMM must obtain updates from the WSUS server. Which actions should you perform in VMM and which actions should you perform in Configuration Manager? To answer, select the appropriate options in the answer area. 1. In the VMM console, open the Fabric workspace. 2. On the Home tab, in the Add group, click Add Resources, and then click Update Server. VMM provides two sample built-in updates baselines that you can use to apply security updates and critical updates to the computers in your VMM environment. Before you can use a baseline, you must specify an assignment scope which contains the host groups, host clusters, individual managed computers, or (as of System Center 2012 R2) infrastructure servers that the baseline is applied to. * Create collections in System Center 2012 Configuration Manager to represent logical groupings of users or devices. Download the latest Microsoft 70-246 204q dumps from Lead2pass. 100% Guarantee and all the dumps are up-to-dated. 70-246 Dumps, 70-246 Exam Questions, 70-246 New Questions, 70-246 PDF, 70-246 VCE, Microsoft 70-246 Braindump, 70-246 dumps, 70-246 Exam Questions, 70-246 New Questions, 70-246 PDF, 70-246 Practice Test, 70-246 VCE. permalink.